An Inference is a conclusion we come to by analyzing Information. It is inductive reasoning: looking at facts and then making a conclusion from those facts. 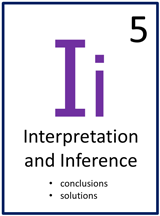 An Interpretation is an Inference from a specific Point of View. Two people might have the same facts, but with different Points of View, they may each come to a different solution to the problem. Conclusions make sense of the data; they are the unifying ideas of the research. In a conclusion we find a solution to the Question at Issue. We have figured it out. Interpretations and Inferences must be logical. Did you interpret the data correctly? Have you gone deep enough into the data to unearth the most reasonable solution? Is what you have come to the best solution to the problem? Is this the only solution possible? Are there other solutions that may not only work, but are better? Which are inconsequential? Could you be wrong? When we come to a good conclusion, it’s natural to feel that thinking is done. Actually, now we must work even harder and recheck each of the Elements of Thought. Any answer invariably leads us to more questions.